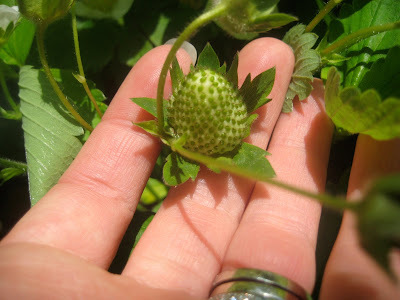 Many avid gardeners claim that the third season for strawberry-lings are their BIG year... and I am now a believer! I can't wait for my berries to ripen! Do YOU have any favorite strawberry recipes worth sharing? I'd LOVE to hear/taste them! It's our third season for strawberries, too. I'm really looking forward to harvesting them, but a certain little boy keeps eating the white ones. Oh, that's gross! And funny... and sad all at the same time! Ooh, I miss strawberries! We planted them at our old house and got one season out of them before moving! A good recipe from my aunt...it's not really a recipe, but it's delicious. You dip your strawberry in some sour cream, then in brown sugar and enjoy. It sounds a little odd, but it's delicious. My son finished off a whole bowl before the rest of my family even got to my aunt's for supper! Mmmm, sounds good (and easy) to me! !